Travelling across three continents, Justin Rowlatt investigates the spread of Chinese influence around the planet and asks what the world will be like if China overtakes America as the world’s economic superpower. In the first of two films, he embarks on a journey across Southern Africa to chart the extraordinary phenomenon of Chinese migration to Africa, and the huge influence of China on the development of the continent.While many in the West view Africa as a land of poverty, to the Chinese it is seen as an almost limitless business opportunity. From Angola to Tanzania, Justin meets the fearless Chinese entrepreneurs who have travelled thousands of miles to set up businesses. I think this movie’s idea is from “The Russian Are Coming”. It was actually very funny to watch. I was amused and laughed a lot when Justin Rowlatt trying very hard to taste which chicken is better, the Chinese chicken or the African chicken (based on that the chicken is provided by African farmer who don’t like Chinese). He also tried to prove that the Brazil bikini is better than the ones made in China but he forgot that the point is how much money people are willing to pay, quality always comes with a price. The movie shows Chinese are taking over the world. Justin investigated what Chinese influence meant for African countries, nicely skewering racist presumptions about China as he travelled. Intriguingly, the Chinese have often revivified old British colonial infrastructures. But are they as rapacious as the British were? Could the Chinese do the same for Britain? Probably not. 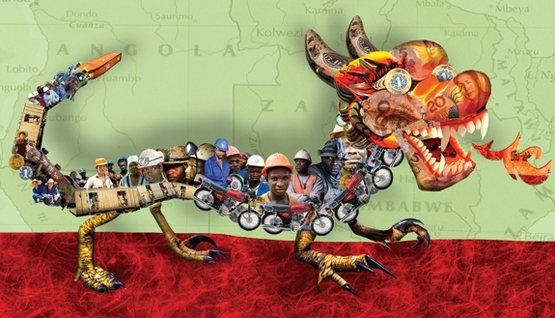 At least Africans have stuff – copper, cobalt, cheap labour – that is what the Chinese want and paying for. What does British have? Maybe celebrities?! The other new idea is learning Chinese means being possibily brian washed by Chinese communist party, and it has something to do with confucianism(that’s a really big joke). In the end, my question is that why can’t the producer from BBC do better? Please, make them visit Shanghai and I’d be so happy to give them a tour .